Two new drugs provide startling benefits in the treatment of age-related macular degeneration (AMD). The clinical and cost effectiveness of ranibizumab (Lucentis) was compared to that of bevacizumab (Avastin), which costs up to 100 times less. A cost effectiveness model was developed to assess the cost per quality adjusted life year (QALY) over 10 years. For predominantly classic AMD, the efficacy of bevacizumab relative to ranibizumab would have to be around 40% for the latter to achieve £30k per QALY, a NICE threshold. Similar but worse results applied to the other main forms of AMD, minimally occult and occult with no classic lesions. The price of ranibizumab would have to be drastically reduced for it to be cost effective. Continued unlicensed use of bevacizumab raises ethical, legal and policy questions. Public pressure may be the most potent weapon in persuading Genentech to license bevacizumab for AMD. New drugs for age-related neovascular macular degeneration (AMD) reverse the disease process, usually leading to gains in visual acuity. Two new drugs are available, one licensed for AMD, the other not. Ranibizumab (Lucentis), licensed in the USA in 2006 (and in the EU in 2007), costs almost US$2000 per injection. Bevacizumab (Avastin), its close relative, is licensed for cancer but not for macular degeneration. It costs between US$17 and US$50 per injection, based on splitting up doses licensed for cancer into minute amounts for injection into the eye.1 Roche/Genentech owns both drugs but has no plans to license the cheaper. Bevacizumab has been widely used globally off-license, although currently there is no clinical trial evidence of its efficacy in treating AMD compared with sham treatment (placebo) or ranibizumab. Given it costs 1–3% of the price of ranibizumab,1 we modelled how much better the dearer drug would have to be to meet NICE’s threshold of £30k per quality adjusted life year (QALY). Ranibizumab is licensed in the USA for two forms of AMD (predominantly classic (PC) and minimally classic or occult (MC/OC) lesions) and shows similar visual acuity gains with each form. We mainly report results for PC, the scenario most favourable to ranibizumab, but also provide results for MC/OC. For patients with PC lesions, data on efficacy, dosing and serious ocular side effects are from the licensing trial which compared ranibizumab to photodynamic therapy with verteporfin.2 The natural history of disease progression, applied in the model once treatment had ceased, was based on an indirect comparison with another trial3 with a relevant control arm, since the ANCHOR trial did not include a sham treatment arm. For patients with MC/OC lesions, data on efficacy, dosing and side effects were taken from the MARINA trial, in which ranibizumab was compared with sham injections and treatment continued for a maximum of 2 years.4 Post-treatment disease progression was based on outcomes reported for the patients in the sham arm of the trial. Lacking clinical trial data for bevacizumab, we employed a range for its efficacy relative to ranibizumab. 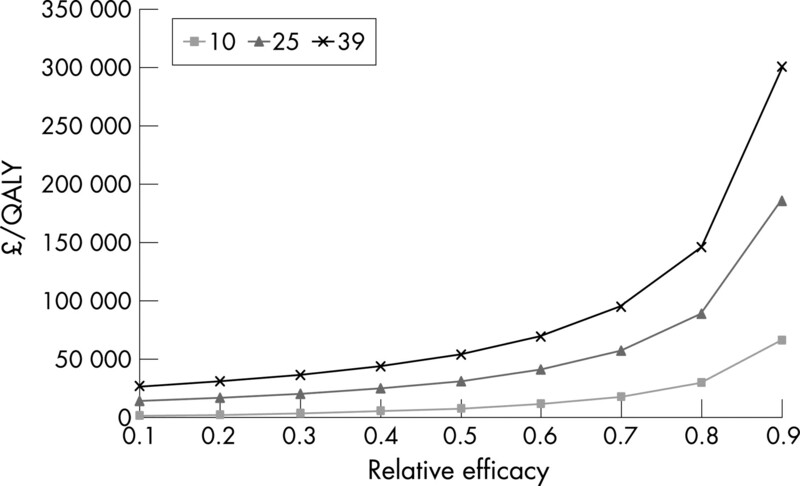 Having estimated the incremental cost per QALY for each level of relative efficacy, we changed side effects and prices in sensitivity analysis. We developed a Markov model, based on two previous models,5 6 amended to allow for gains as well as losses in visual acuity. The model had six health states, five defined by visual acuity plus a death state. Transition probabilities for vision loss and vision gain were based on the relevant ranibizumab trial.2 4 Utilities for each health state were based on a study7 linking visual acuity and utilities. Patients entered the model at 75 years of age with follow-up to 85 or death. They started in the second least severe state to allow improvement. Two groups of patients were modelled, those gaining and those losing visual acuity, based on the licensing trials.2 4 Treatment was continued monthly as in licensing trials, for 1 year in PC and 2 years in MC/OC. After treatment, disease progression for untreated patients was applied. The most severe states (visual acuity less than 6/60) had an annual cost based on the cost of near-blindness.8 9 Patient mortality reflected UK averages for the relevant ages,10 with a 50% increased mortality risk assumed for the more severe health states.11 The model was simulated for 1000 patients in 3-month cycles. Figure 1 Cost per QALY of ranibizumab versus bevacuzimab, by relative efficacy and price ratio (10, 25 and 39) in patients with PC lesions. The price ratio of ranibizumab to bevacizumab was 39:1, based on the US price of US$1950 (£1025) per injection for ranibizumab and (a high) US$50 (£26) for bevacizumab. NHS costs were estimated for drug administration and monitoring of patients as well as treatment of side effects using NHS Reference Costs.12 NHS and personal social services costs for near-blindness were based on previously published estimates.9 The efficacy of bevacizumab relative to ranibizumab was varied from 0.1 to 0.9. The perspective of the analysis was that of the NHS and personal social services. Both cost and utilities were discounted at an annual rate of 3.5%. In the base case for each form of the disease, the side effect profile of the two drugs was equal. Sensitivity analyses doubled the side effect profile of bevacizumab and reduced the price ratio to 25 and 10. Figure 2 Cost per QALY of ranibizumab versus bevacuzimab, by relative efficacy and price ratio (10, 25 and 39) in patients with MC/OC lesions. 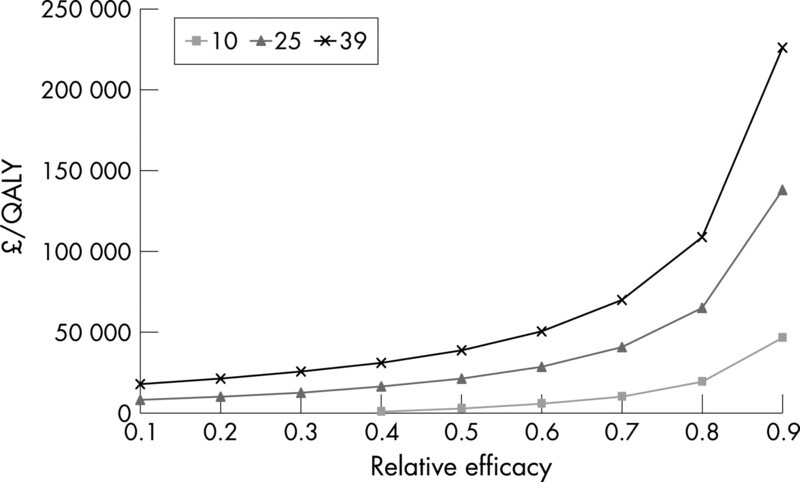 The results (fig 1) indicate that the efficacy of bevacizumab relative to ranibizumab in PC would have to be low for the latter to achieve an acceptable level of cost effectiveness. Only when relative efficacy was reduced to 0.4 did the cost per QALY fall to £31 092. At 0.8 the cost per QALY was well over £100 000. Doubling event rates for serious ocular adverse effects for bevacizumab had minimal (<1%) effect on the cost per QALY. Reducing the price ratio improved the cost per QALY as expected. Relative efficacies of 0.65 and 0.85 would be required to meet the NICE threshold at price ratios of 25 and 10, respectively. Similar results applied to MC/OC, as shown in fig 2, which differs only in being less favourable to ranibizumab, due mainly to 2 years of treatment being required. Given our model, like all others, combined data from a variety of sources, what might the main biases be? The main deficiency, lack of head-to-head data on relative effectiveness, was solved by assuming a full range of possible values. Although we used data from a different trial for natural disease progression in PC, any bias would apply equally to both drugs compared to this baseline. Side effect data were taken from the licensing trials for ranibizumab, but lacking similar data for bevacizumab, the assumption that its side effect profile was twice as bad made minimal difference in sensitivity analysis. The available data indicate its side effect profile is similar to that of ranibizumab.19 In translating changes in visual acuity to quality of life scores, we relied on previous work which we acknowledge was small scale. More generally, when in doubt we have biased our assumptions favourable to ranibizumab so that our estimates are conservative. Some 25 000 new UK cases of neovascular AMD might be eligible for treatment each year. A year of treatment, with monthly injections of ranibizumab at £1000 each, costs £300m. Treatment with bevacizumab, as modelled above, would cost 2.6% of that. The difference of £292m represents the opportunity cost. NICE will issue guidance in late 2007 on ranibizumab compared to best supportive care and photodynamic therapy where appropriate, for patients with the subfoveal choroidal neovascularisation (CNV) associated with wet AMD. Bevacizumab has been omitted from the appraisal as it is unlicensed. A recommendation in favour of ranibizumab would make recruitment to any UK head-to-head trial of ranibizumab and bevacizumab impossible for these patients. The Department of Health should arguably have broken with precedent to refer bevacizumab to NICE as part of its review, widened to include the relevant forms of AMD. Ownership of the two drugs by a single company unwilling to license the cheaper one points to policy limitations. The separation of licensing (based on safety and efficacy) from cost effectiveness means that the company can avoid assessment of the latter by refusing to license. Although use of an unlicensed drug is not illegal, prescribers may feel pressured to use the more expensive licensed alternative. Even if a clinical trial showed the two drugs to be equivalent, it is not clear how bevacizumab could be authorised for use given the refusal by its owner to license it. Roche and its subsidiary Genentech own almost half the global market in monoclonal antibodies. Besides bevacizumab and ranibizumab, similar highly priced drugs from this company include trastuzumab (herceptin) and rituximab. These drugs have the potential to treat different diseases, as shown by the use of bevacizumab for cancer and macular degeneration. The response by health systems to this problem of differential pricing of very similar drugs for different diseases is of major importance.
. The price of sight - ranibizumab, bevacizumab, and the treatment of macular degeneration. N Engl J Med 2006;355(14):1409–12.
. Ranibizumab versus verteporfin for neovascular age-related macular degeneration. N Engl J Med 2006;355(14):1432–44.
. Verteporfin therapy of subfoveal choroidal neovascularization in patients with age-related macular degeneration. Arch Ophthalmol 2002;120(11):1443–54.
. Ranibizumab for neovascular age-related macular degeneration. N Engl J Med 2006;355(14):1419–31.
. The cost-effectiveness of photodynamic therapy for fellow eyes with subfoveal choroidal neovascularization secondary to age-related macular degeneration. Ophthalmology 2001;108(11):2051–9.
. Cost effectiveness of photodynamic therapy with verteporfin for age related macular degeneration: the UK case. Br J Ophthalmol 2004;88(9):1107–12.
. Utility values and age-related macular degeneration. Arch Ophthalmol 2000;118(1):47–51.
. Clinical effectiveness and cost-utility of photodynamic therapy for wet age-related macular degeneration: a systematic review and economic evaluation. Health Technol Assess 2003;7(9):98.
. What is the cost of blindness? Br J Ophthalmol 2003;87(10):1201–4. Government Actuary’s Department. UK Interim Life Tables 2002–2004. London: GAD, 2005.
. Evaluating the risk of mortality for exudative (wet) AMD patients compared to a control group. Invest Ophthalmol Vis Sci 2006;47:E-Abstract, 2213. Department of Health. NHS Reference Cost 2005. London: Department of Health, 2006, Available from http://www.dh.gov.uk/PublicationsAndStatistics/Publications/PublicationsPolicyAndGuidance/PublicationsPolicyAndGuidanceArticle/fs/en?CONTENT_ID=4133221&chk=TxHkqo (accessed 29 June 2007).
. Regression of retinal and iris neovascularization after intravitreal bevacizumab (Avastin) treatment. Retina 2006;26(3):352–4.
. Intravitreal bevacizumab (Avastin) for neovascular age-related macular degeneration. Ophthalmology 2006;113(3):363–72.
. Intravitreal bevacizumab (Avastin) treatment of macular edema in central retinal vein occlusion: a short-term study. Retina 2006;26(3):279–84.
. Intravitreal bevacizumab in a patient with neovascular glaucoma. Ophthalmic Surg Lasers Imaging 2006;37(2):144–6.
. Intravitreal bevacizumab treatment of choroidal neovascularization secondary to age-related macular degeneration. Retina 2006;26(4):383–90.
. Intravitreal bevacizumab (Avastin) treatment of proliferative diabetic retinopathy complicated by vitreous hemorrhage. Retina 2006;26(3):275–8.
. Intravitreal Avastin safety survey: results from the world wide web. Invest Ophthalmol Vis Sci 2006;47(5):5251. British Journal of Ophthalmology 2007; 91 1099-1099 Published Online First: 20 Aug 2007.